This morning’s Job Openings and Labor Turnover Summary (JOLTS) shows that the total number of job openings in October was 4.8 million, up 149,000 since September. Meanwhile, according to the Census’s Current Population Survey, there were nearly 9.0 million job seekers, which means there were 1.9 times as many job seekers as job openings in October. This is the first time since the Great Recession that the jobs-seekers-to-job-openings ratio fell below 2.0. While we are moving in the right direction, keep in mind that in a labor market with strong job opportunities, there would be roughly as many job openings as job seekers, while in October, job seekers still so outnumbered job openings that nearly half of the unemployed were not going to find a job no matter what they did. 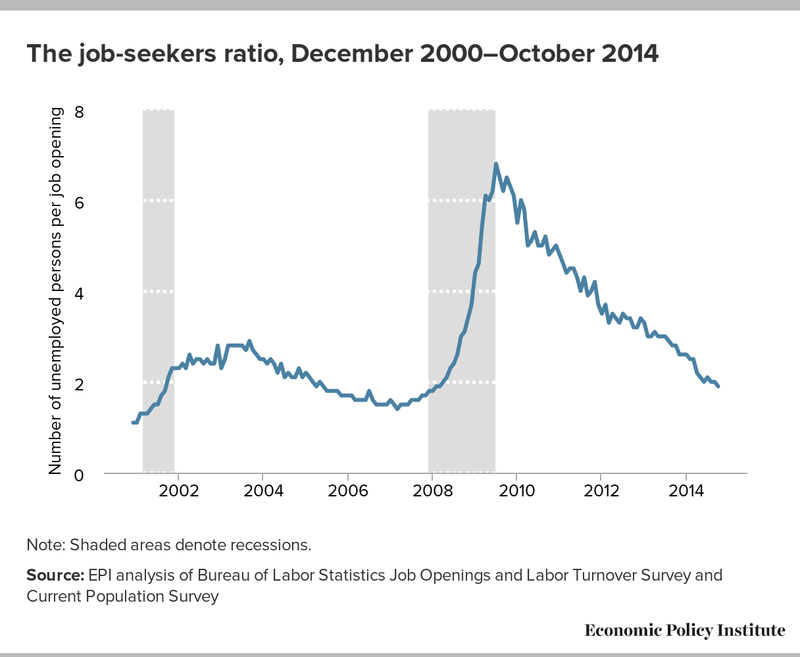 The slight decline in the jobs-seekers-to-job-openings ratio in October comes on the heels of a steady decrease since its high of 6.8-to-1 in July 2009, as you can see in the figure below. The ratio has fallen by 0.9 over the last year. At the same time, the 9.0 million unemployed workers understates how many job openings will be needed when a robust jobs recovery finally begins, due to the existence of 5.8 million potential workers (in October) who are currently not in the labor market, but who would be if job opportunities were strong. Many of these “missing workers” will go back to looking for a job when the economy really picks up, so job openings will be needed for them, too. Furthermore, a job opening when the labor market is weak often does not mean the same thing as a job opening when the labor market is strong. There is a wide range of “recruitment intensity” with which a company can deal with a job opening. For example, if a company is trying hard to fill an opening, it may increase the compensation package and/or scale back the required qualifications. Conversely, if it is not trying very hard, it may hike up the required qualifications and/or offer a meager compensation package. Perhaps unsurprisingly, research shows that recruitment intensity is cyclical—it tends to be stronger when the labor market is strong, and weaker when the labor market is weak. This means that when a job opening goes unfilled when the labor market is weak, as it is today, companies may very well be holding out for an overly-qualified candidate at a cheap price.